The Answer of Thomas Houghton, to the Appeal of Sir George Caswall Knight and others, was brought in. Sir W. Courtenay & al. Pet. referred to Judges. It is Ordered, That the Consideration of the said Petition be, and is hereby, referred to the Lord Chief Justice of the Court of King's Bench and the Lord Chief Justice of the Court of Common Pleas; with the usual Directions, according to the Standing Orders. Seymour & al. Pet. referred to Judges. Stanhope's Pet. referred to Judges. It is Ordered, That the Consideration of the said Petition be, and is hereby, referred to the Lord Chief Justice of the Court of Common Pleas and Mr. Baron Thomson; with the usual Directions, according to the Standing Order. Papers from the Board of Trade, concerning the Depredations of the Spaniards. "1. Copy of a Letter to the Lord Carteret, with a Representation to His late Majesty, upon the Spanish Ambassador's Complaint, relating to a Fort lately built by the Governor of South Carolina, dated the 20th of December, 1722." "2. Copy of a Letter to the Duke of Newcastle, with a Representation and State of the British Possessions in America disputed by the King of Spain, &c. dated 20th June, 1728." "3. Copy of a Representation to His Majesty, from the Governor, Council, and Assembly of South Carolina, relating to the State of that Province, dated the 9th of April, 1734." "4. Copy of the Representation of William Bull Esquire, President and Commander in Chief of South Carolina, to the Commissioners for Trade and Plantations, dated the 25th of May, 1738, setting forth His Majesty's Title to that Province." Hodie 1a vice lecta est Billa, intituled, "An Act for vesting a Messuage and Lands in Twickenham, late the Estate of the Honourable William Townshend Esquire, deceased, in Trustees, in Trust to sell the same, pursuant to an Article entered into by the said William Townshend in his Life-time; and for applying the Money arising by such Sale for the Benefit of Charles Townshend, his only Son and Heir, an Infant." It was moved, "To order, That an humble Address be presented to His Majesty, to return Him the Thanks of this House, for having been graciously pleased to lay before us the Convention between His Majesty and the King of Spain, dated the Fourteenth Day of January last, N. S. together with Separate Articles; and to express the just Sense which this House hath of His Royal Care of the true Interests of His People: To acknowledge His Majesty's great Prudence, in bringing the Demands of His Subjects for their past Losses, which have been so long depending, to a final Adjustment by the said Convention, and pro curing an express Stipulation for a speedy Payment; and in laying a Foundation for accomplishing the great and desirable Ends of obtaining future Security, and preserving the Peace between the Two Crowns: To declare our Considence and Reliance on His Majesty's Royal Wisdom, and steady Attention to the Honour of His Crown and the Welfare of these Kingdoms; that, in the Treaty to be concluded in Pursuance of this Convention, proper Provisions will be made for Redress of the Grievances so justly complained of; and particularly, that the Freedom of Navigation and Commerce in The American Seas, to which His Majesty's Subjects are entitled by the Law of Nations, and by virtue of the Treaties subsisting between the Two Crowns, will be so effectually secured, that they may enjoy unmolested their undoubted Right of navigating and carrying on Trade and Commerce from one Part of His Majesty's Dominions to any other Part thereof, without being liable to be stopped, visited, or searched, on the open Seas, or to any other Violation or Infraction of the said Treaties; the mutual Observance thereof, and a just Regard to the Privileges belonging to each other, being the only Means of maintaining a good Correspondence and lasting Friendship between the Two Nations: To express also our firm Dependence, that, in the Treaty to be concluded in Pursuance of the said Convention, the utmost Regard will be had to the Rights belonging to His Majesty's Crown and Subjects, in adjusting and settling the Limits of His Majesty's Dominions in America: And to give His Majesty the strongest Assurances, that, in case His just Expectations shall not be answered, this House will heartily and zealously concur in all such Measures as shall be necessary, to vindicate His Majesty's Honour, and to preserve to His People the full Enjoyment of all those Rights to which they are entitled by Treaty and the Law of Nations." 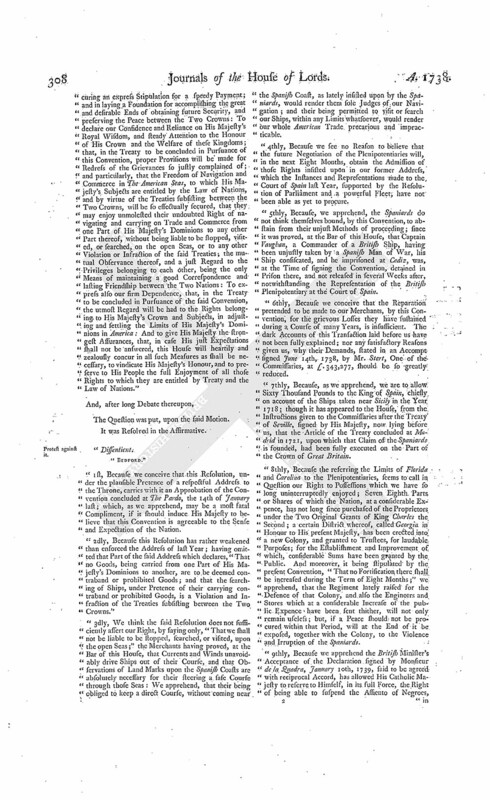 "1st, Because we conceive that this Resolution, under the plausible Pretence of a respectful Address to the Throne, carries with it an Approbation of the Convention concluded at The Pardo, the 14th of January last; which, as we apprehend, may be a most fatal Compliment, if it should induce His Majesty to believe that this Convention is agreeable to the Sense and Expectation of the Nation. "2dly, Because this Resolution has rather weakened than enforced the Address of last Year; having omitted that Part of the said Address which declares, "That no Goods, being carried from one Part of His Majesty's Dominions to another, are to be deemed contraband or prohibited Goods; and that the searching of Ships, under Pretence of their carrying contraband or prohibited Goods, is a Violation and Infraction of the Treaties subsisting between the Two Crowns." "3dly, We think the said Resolution does not sufficiently assert our Right, by saying only, "That we shall not be liable to be stopped, searched, or visited, upon the open Seas;" the Merchants having proved, at the Bar of this House, that Currents and Winds unavoidably drive Ships out of their Course, and that Observations of Land Marks upon the Spanish Coasts are absolutely necessary for their steering a safe Course through those Seas: We apprehend, that their being obliged to keep a direct Course, without coming near the Spanish Coast, as lately insisted upon by the Spaniards, would render them sole Judges of our Navigation; and their being permitted to visit or search our Ships, within any Limits whatsoever, would render our whole American Trade precarious and impracticable. "4thly, Because we see no Reason to believe that the future Negotiation of the Plenipotentiaries will, in the next Eight Months, obtain the Admission of those Rights insisted upon in our former Address, which the Instances and Representations made to the Court of Spain last Year, supported by the Resolution of Parliament and a powerful Fleet, have not been able as yet to procure. "5thly, Because, we apprehend, the Spaniards do not think themselves bound, by this Convention, to abstain from their unjust Methods of proceeding; since it was proved, at the Bar of this House, that Captain Vaughan, a Commander of a British Ship, having been unjustly taken by a Spanish Man of War, his Ship consiscated, and he imprisoned at Cadiz, was, at the Time of signing the Convention, detained in Prison there, and not released in several Weeks after, notwithstanding the Representation of the British Plenipotentiary at the Court of Spain. 6thly, Because we conceive that the Reparation pretended to be made to our Merchants, by this Convention, for the grievous Losses they have sustained during a Course of many Years, is insufficient. The dark Accounts of this Transaction laid before us have not been fully explained; nor any satisfactory Reasons given us, why their Demands, stated in an Accompt signed June 14th, 1738, by Mr. Stert, One of the Commissaries, at £.343,277, should be so greatly reduced. "7thly, Because, as we apprehend, we are to allow Sixty Thousand Pounds to the King of Spain, chiesly on account of the Ships taken near Sicily in the Year 1718; though it has appeared to the House, from the Instructions given to the Commissaries after the Treaty of Seville, signed by His Majesty, now lying before us, that the Article of the Treaty concluded at Madrid in 1721, upon which that Claim of the Spaniards is founded, had been fully executed on the Part of the Crown of Great Britain. 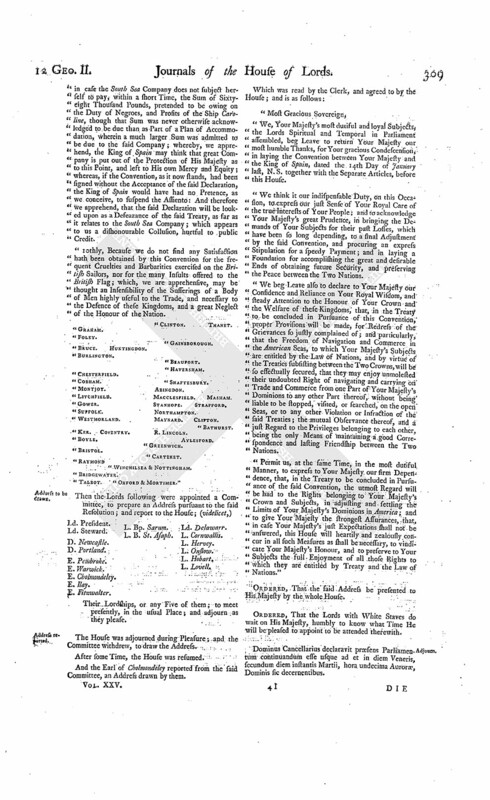 "8thly, Because the referring the Limits of Florida and Carolina to the Plenipotentiaries, seems to call in Question our Right to Possessions which we have so long uninterruptedly enjoyed; Seven Eighth Parts or Shares of which the Nation, at a considerable Expence, has not long since purchased of the Proprietors under the Two Original Grants of King Charles the Second; a certain District whereof, called Georgia in Honour to His present Majesty, has been erected into a new Colony, and granted to Trustees, for laudable Purposes; for the Establishment and Improvement of which, considerable Sums have been granted by the Public. And moreover, it being stipulated by the present Convention, "That no Fortification there shall be increased during the Term of Eight Months;" we apprehend, that the Regiment lately raised for the Defence of that Colony, and also the Engineers and Stores which at a considerable Increase of the public Expence have been sent thither, will not only remain useless; but, if a Peace should not be procured within that Period, will at the End of it be exposed, together with the Colony, to the Violence and Irruption of the Spaniards. "9thly, Because we apprehend the British Minister's Acceptance of the Declaration signed by Monsieur de la Quadra, January 10th, 1739, said to be agreed with reciprocal Accord, has allowed His Catholic Majesty to reserve to Himself, in its full Force, the Right of being able to suspend the Assiento of Negroes, in case the South Sea Company does not subject herself to pay, within a short Time, the Sum of Sixtyeight Thousand Pounds, pretended to be owing on the Duty of Negroes, and Profits of the Ship Caroline, though that Sum was never otherwise acknowledged to be due than as Part of a Plan of Accommodation, wherein a much larger Sum was admitted to be due to the said Company; whereby, we apprehend, the King of Spain may think that great Company is put out of the Protection of His Majesty as to this Point, and left to His own Mercy and Equity; whereas, if the Convention, as it now stands, had been signed without the Acceptance of the said Declaration, the King of Spain would have had no Pretence, as we conceive, to suspend the Assiento: And therefore we apprehend, that the said Declaration will be looked upon as a Defeazance of the said Treaty, as far as it relates to the South Sea Company; which appears to us a dishonourable Collusion, hurtful to public Credit. "10thly, Because we do not find any Satisfaction hath been obtained by this Convention for the frequent Cruelties and Barbarities exercised on the British Sailors, nor for the many Insults offered to the British Flag; which, we are apprehensive, may be thought an Insensibility of the Sufferings of a Body of Men highly useful to the Trade, and necessary to the Defence of these Kingdoms, and a great Neglect of the Honour of the Nation. E. Fitzwalter. L. Bp. Sarum. Their Lordships, or any Five of them; to meet presently, in the usual Place; and adjourn as they please. And the Earl of Cholmondeley reported from the said Committee, an Address drawn by them. 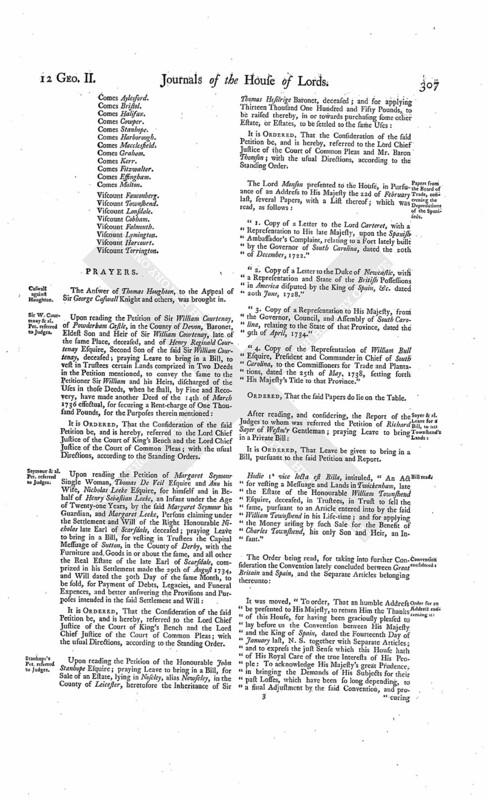 "We, Your Majesty's most dutiful and loyal Subjects, the Lords Spiritual and Temporal in Parliament assembled, beg Leave to return Your Majesty our most humble Thanks, for Your gracious Condescension, in laying the Convention between Your Majesty and the King of Spain, dated the 14th Day of January last, N. S. together with the Separate Articles, before this House. "We think it our indispensable Duty, on this Occasion, to express our just Sense of Your Royal Care of the true Interests of Your People; and to acknowledge Your Majesty's great Prudence, in bringing the Demands of Your Subjects for their past Losses, which have been so long depending, to a final Adjustment by the said Convention, and procuring an express Stipulation for a speedy Payment; and in laying a Foundation for accomplishing the great and desirable Ends of obtaining future Security, and preserving the Peace between the Two Nations. "We beg Leave also to declare to Your Majesty our Confidence and Reliance on Your Royal Wisdom, and steady Attention to the Honour of Your Crown and the Welfare of these Kingdoms, that, in the Treaty to be concluded in Pursuance of this Convention, proper Provisions will be made, for Redress of the Grievances so justly complained of; and particularly, that the Freedom of Navigation and Commerce in the American Seas, to which Your Majesty's Subjects are entitled by the Law of Nations, and by virtue of the Treaties subsisting between the Two Crowns, will be so effectually secured, that they may enjoy unmolested their undoubted Right of navigating and carrying on Trade and Commerce from one Part of Your Majesty's Dominions to any other Part thereof, without being liable to be stopped, visited, or searched, on the open Seas, or to any other Violation or Infraction of the said Treaties; the mutual Observance thereof, and a just Regard to the Privileges belonging to each other, being the only Means of maintaining a good Correspondence and lasting Friendship between the Two Nations. "Permit us, at the same Time, in the most dutiful Manner, to express to Your Majesty our firm Dependence, that, in the Treaty to be concluded in Pursuance of the said Convention, the utmost Regard will be had to the Rights belonging to Your Majesty's Crown and Subjects, in adjusting and settling the Limits of Your Majesty's Dominions in America; and to give Your Majesty the strongest Assurances, that, in case Your Majesty's just Expectations shall not be answered, this House will heartily and zealously concur in all such Measures as shall be necessary, to vindicate Your Majesty's Honour, and to preserve to Your Subjects the full Enjoyment of all those Rights to which they are entitled by Treaty and the Law of Nations." Dominus Cancellarius declaravit præsens Parliamentum continuandum esse usque ad et in diem Veneris, secundum diem instantis Martii, hora undecima Auroræ, Dominis sic decernentibus. The King to be attended with Address. The Lord Steward acquainted the House, "That the Lords with White Staves had (according to Order) waited on His Majesty, to know when He would be pleased to be attended with the Address of this House Yesterday; and that His Majesty had been pleased to appoint this Day, at Two a Clock, at His Palace of St. James's." The Lord Hobart reported from the Lords Committees to whom the Bill, intituled, "An Act for Sale of Part of the Estate of Richard Berney Esquire, deceased, for discharging Encumbrances thereupon," was committed: "That they had considered the said Bill, and examined the Allegations thereof, which they found to be true; that the Parties concerned had given their Consents; and that the Committee had gone through the Bill, with some Amendments." Murison & al. Nat. Bill. To return the Bill, intituled, "An Act for naturalizing Jacob Hoffham Murison and Nathaniel Voogd;" and to acquaint this House, that they have agreed to their Lordships Amendments made thereto. To return the Bill, intituled, "An Act for naturalizing James Nadal and William Rene Morin;" and to acquaint this House, that they have agreed to their Lordships Amendments made thereto. Sir James Mackenzie of Royston's Bill. Hodie 2a vice lecta est Billa, intituled, "An Act to enable Sir James McKenzie of Royston to sell Lands and Hereditaments, in the Sheriffdom of Edinburgh, for Payment of Debts and Encumbrances charged upon and affecting the same." E. Bristol. L. Bp. Chichester. L. Bp. Landaff. L. Clifton. Their Lordships, or any Five of them; to meet on Monday the 19th Instant, at the usual Time and Place; and to adjourn as they please. Hodie 2a vice lecta est Billa, intituled, "An Act for vesting a Messuage and Lands in Twickenham, late the Estate of the Honourable William Townshend Esquire, deceased, in Trustees, in Trust to sell the same, pursuant to an Article entered into by the said William Townshend in his Life-time; and for applying the Money arising by such Sale for the Benefit of Charles Townshend, his only Son and Heir, an Infant." The House being moved, "That a Day may be appointed, for hearing Counsel, to argue the Errors assigned upon a Writ of Error, wherein John Kent and James May are Plaintiffs, and Robert Whitby and Catherine his Wife Defendants:"
It is Ordered, That this House will hear the said Errors argued, by Counsel, at the Bar, on Monday Sevennight. Annesley's Petition; Report to be received. The Earl of Warwick acquainted the House, "That the Committee of Privileges, to whom the Petition of Francis Annesley Esquire, in relation to the Earl of Anglesey's Privilege, was referred, had directed him to make a Special Report thereupon to the House; which he was ready to do, when their Lordships should be pleased to receive the same." Ordered, That the said Report be received on Tuesday next; and the Lords to be summoned. Murray Kinnynmound's Appeal to be amended. Upon reading the Petition of Alexander Hamilton Gentleman, Agent for Hugh Murray Kynnynmound Esquire and others; praying Liberty to amend his Client's Appeal, by altering the Date of an Interlocutor therein complained of, from the 3d of June 1738, to the 27th of the same Month. Ordered, That the Petitioner have Liberty to amend the said Appeal, as desired; he amending the Respondents Copy. Dominus Cancellarius declaravit præsens Parliamentum continuandum esse usque ad et in diem Martis, sextum diem instantis Martii, hora undecima Auroræ, Dominis sic decernentibus. Murray against Sir James Dalrymple. Kinloch against Sir James Dalrymple. As was also, the Answer of the said Sir James, to the Appeal of Mr. Francis Kinloch Advocate. "I thank you for this dutiful Address, and for the grateful Sense you express of My Care of the true Interests of My People: You may depend upon it, that I have the Honour of My Crown, and the Welfare of My Kingdoms, entirely at Heart; and that nothing shall be wanting, on my Part, to secure to My Subjects the full Enjoyment of their Navigation and Commerce, and their other just Rights." Hodie 1a vice lecta est Billa, intituled, "An Act for discharging the Estate of John Sherwin Esquire, in the County of Hertford, from the Uses, Trusts, and Covenants, in his Marriage Settlement; and for settling an Estate, in the County of Nottingham, and Town and County of the Town of Nottingham, of greater Value, in Lieu thereof, to the like Uses." With a Bill, intituled, "An Act for punishing Mutiny and Desertion, and for the better Payment of the Army and their Quarters;" to which they desire the Concurrence of this House. Brooksbank's Petition referred to Judges. Fownes Petition referred to Judges. Bewholm Common to enclose, Leave for a Bill. Pailton Common to enclose, Leave for Bill. Respondents peremptorily to answer Murray Kynnynmound's Appeal. The House was informed, "That several of the Respondents to the Appeal of Mr. Hugh Murray Kynnynmound have not put in their Answers to the said Appeal, though duly served with the Order of this House for that Purpose." Ordered, That all the Respondents to the said Appeal, who have been served with the said Order, that have not already answered, do peremptorily put in their Answer or respective Answers in a Week. Brewer to take the Name of Risley, Leave for a Bill. Papers in several Causes proved. "Vernon against Vernon: and Johnson against Price. He was called in; and delivered, at the Bar the said Proceedings; and attested upon Oath, "The same were true Copies, he having examined them with the Originals in the proper Offices in Ireland." Annesley's Report E. Anglesey's Privilege restrained. 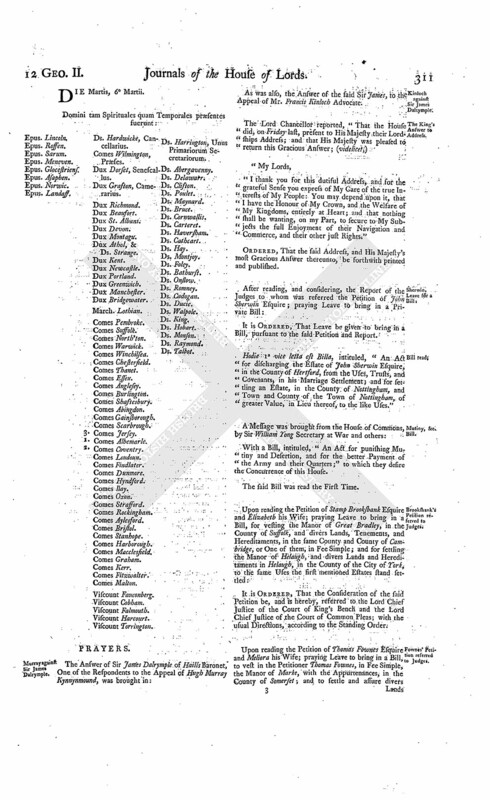 "That the Committee conceiving several Particulars set forth in the Petition to be of such a Nature, that they were not at Liberty to enter into the Consideration thereof; they therefore thought proper to consine themselves to such Parts of the Petition only as they apprehend relate to the Matter of Privilege. "That the Committee taking Notice, it did not appear that any Application had been made by the Petitioner to the Earl of Anglesey, to know whether his Lordship did insist on Privilege or not: And the Counsel for the Petitioner, being asked as to that Matter, acquainted the Committee, "That his Lordship had been applied to for that Purpose; but they were not then prepared to make legal Proof thereof." Whereupon the Committee adjourned the further Consideration of the Petition to the next Day; when the Earl of Anglesey informed the Committee, "That he had been applied to on that Occasion, on the Part of the Petitioner; but declared, that he was advised he could not safely waive his Privilege, and did insist thereupon;" and relied on the Determination of the Lords." 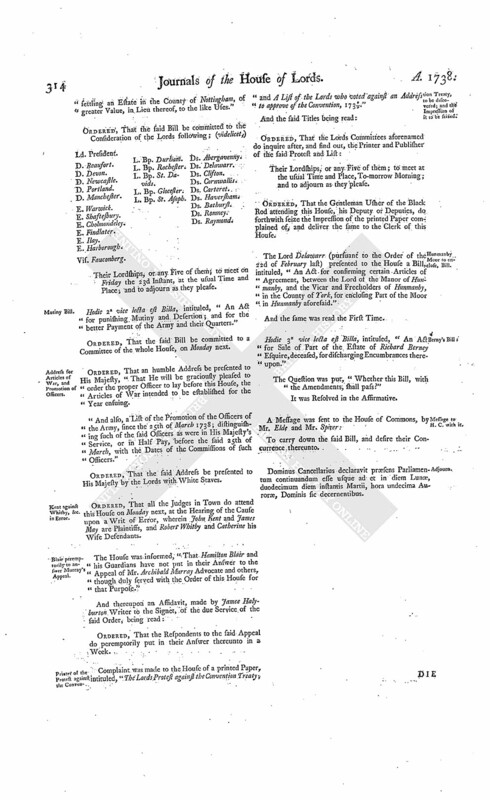 "That the Committee then proceeded to hear Counsel, as well for the Earl of Anglesey as the Petitioner; and think proper to lay before the House the several Facts alleged by the Petitioner's Counsel, and admitted by the Counsel for his Lordship; which are as follow: "That a Bill was exhibited by the said Earl, in the Court of Chancery, the 18th of January 1737, praying to be quieted in the Possession of the Estates in England and Ireland, whereof James late Earl of Anglesey died seized: That the present Earl took out an Attachment, to compel the Petitioner to answer his said Bill, in the Time of Privilege, being the 7th of March following; but it was not served on the Petitioner: That an Answer was put in by the Petitioner, on the 12th of April last; and Exceptions thereto being filed by the Earl of Anglesey, and the Matter referred to a Master in Chancery for a Report thereupon, the Petitioner's said Answer was reported insufficient; that, on the 30th of June following, the Petitioner put in a Second Answer; that an Order was granted for amending the said Bill the 31st of January last, and a Subpæna taken out the 6th, and served the 7th of February last, to compel the Petitioner to answer; that the Petitioner filed his Bill in Chancery against the present Earl the 27th of May last, but an Answer was not put in to it till the 8th of January following, after a Sequestration was served on Part of his Lordship's Estate: The Committee have also examined Mr. Robert Garden, the said Earl's Agent, upon Oath, whether his Lordship had directly or indirectly delayed proceeding in the Cause, or had given the said Garden any Directions directly or indirectly as to any Waiver of Privilege: And he acquainted the Committee, "That the said Earl was so far from delaying the Cause, that he endeavoured to bring it on as much as possible; and that he the said Garden never received any Directions from his Lordship as to any Waiver of his Privilege." 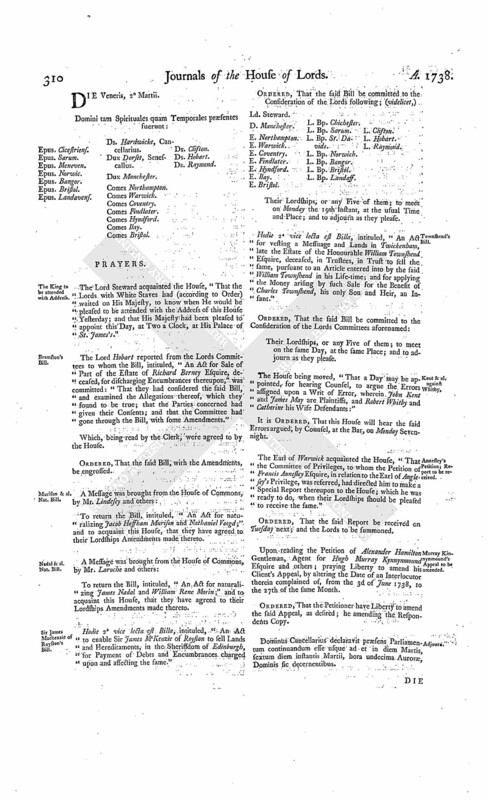 It was moved, "To resolve, That the said Richard Earl of Anglesey hath waived his Privilege of Parliament, as a Peer of Great Britain, in relation to the Suits now depending in the Court of Chancery of Great Britain, on the Bill filed by his Lordship on the 18th Day of January 1737, and on the Bill filed by the Petitioner against the said Earl on the 27th Day of May last, and any Proceedings in, or in Consequence of, the said Suits." Dominus Cancellarius declaravit præsens Parliamentum continuandum esse usque ad et in diem Jovis, octavum diem instantis Martii, hora undecima Auroræ, Dominis sic decernentibus. Sir James Dalrymple against Sir A. Hamilmilton. Miss Buchan against Sir A. Hamilton. As was also, the Answer of the same Sir Alexander, to the Appeal of Mary Buchan Spinster. Ordered, That all the Lords this Day present, who are not of the Committee appointed to consider of Two Private Bills on Friday last, be added to that Committee. Hodie 2a vice lecta est Billa, intituled, "An Act for discharging the Estate of John Sherwin Esquire, in the County of Hertford, from the Uses, Trusts, and Covenants, in his Marriage Settlement; and for settling an Estate in the County of Nottingham, of greater Value, in Lieu thereof, to the like Uses." L. Bp. St. Asaph. Ds. Abergavenny. Their Lordships, or any Five of them; to meet on Friday the 23d Instant, at the usual Time and Place; and to adjourn as they please. Hodie 2a vice lecta est Billa, intituled, "An Act for punishing Mutiny and Defertion; and for the better Payment of the Army and their Quarters." 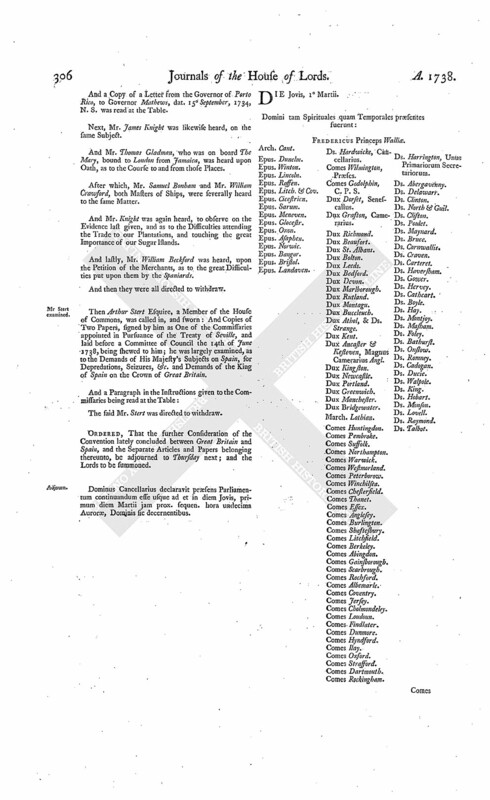 Address for Articles of War, and Promotion of Officers. Ordered, That an humble Address be presented to His Majesty, "That He will be graciously pleased to order the proper Officer to lay before this House, the Articles of War intended to be established for the Year ensuing. "And also, a List of the Promotion of the Officers of the Army, since the 25th of March 1738; distinguishing such of the said Officers as were in His Majesty's Service, or in Half Pay, before the said 25th of March, with the Dates of the Commissions of such Officers." Kent against Whitby, &c. in Error. Ordered, That all the Judges in Town do attend this House on Monday next, at the Hearing of the Cause upon a Writ of Error, wherein John Kent and James May are Plaintiffs, and Robert Whitby and Catherine his Wife Defendants. Blair peremptorily to answer Murray's Appeal. The House was informed, "That Hamilton Blair and his Guardians have not put in their Answer to the Appeal of Mr. Archibald Murray Advocate and others, though duly served with the Order of this House for that Purpose." Ordered, That the Respondents to the said Appeal do peremptorily put in their Answer thereunto in a Week. Printer of the Protest against the Convention Treaty, to be discovered; and the Impression of it to be seized. 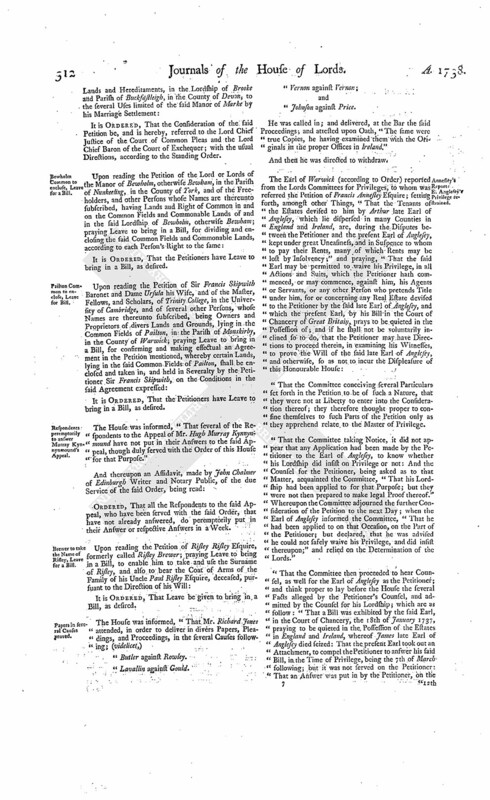 Complaint was made to the House of a printed Paper, intituled, "The Lords Protest against the Convention Treaty; and A List of the Lords who voted against an Address to approve of the Convention, 1738/9." Their Lordships, or any Five of them; to meet at the usual Time and Place, To-morrow Morning; and to adjourn as they please. Ordered, That the Gentleman Usher of the Black Rod attending this House, his Deputy or Deputies, do forthwith seize the Impression of the printed Paper complained of, and deliver the same to the Clerk of this House. Hunmanby Moor to enclose, Bill. 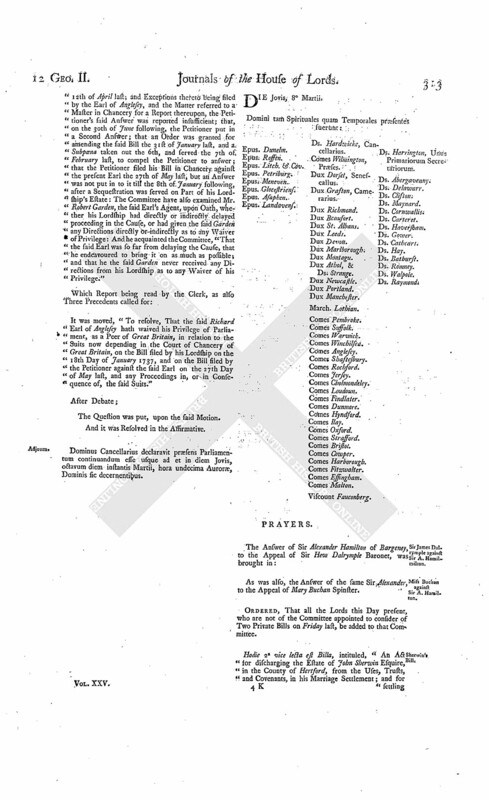 The Lord Delawarr (pursuant to the Order of the 22d of February last) presented to the House a Bill, intituled, "An Act for confirming certain Articles of Agreement, between the Lord of the Manor of Hunmanby, and the Vicar and Freeholders of Hunmanby, in the County of York, for enclosing Part of the Moor in Hunmanby aforesaid." Hodie 3a vice lecta est Billa, intituled, "An Act for Sale of Part of the Estate of Richard Berney Esquire, deceased, for discharging Encumbrances thereupon." Dominus Cancellarius declaravit præsens Parliamentum continuandum esse usque ad et in diem Lunæ, duodecimum diem instantis Martii, hora undecima Auroræ, Dominis sic decernentibus.